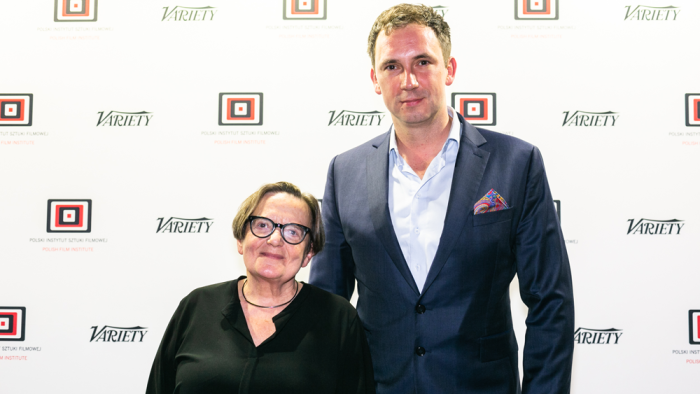 Radoslaw Smigulski (right), general director of the Polish Film Institute, hosted Friday’s Polish Party at Berlin’s Ewerk, where the guests included Agnieszka Holland (left), director of Berlin competition film “Mr. Jones,” and European Film Academy chairwoman. Among the guests were filmmakers Sergei Loznitsa and Olga Chajdas, Antoine le Bos, founder of Groupe Ouest, Philip Ilienko, director of the Ukrainian State Film Agency, Mercedes Fernandez Alonso, the managing director of TorinoFilmLab, Rolandas Kvietkauskas, director of the Lithuanian Film Center, Marketa Šantrochová, head of the Czech Film Center, and Meinolf Zurhorst, head of the ARTE film department at ZDF. Other guests included Bernd Buder, artistic director of the Cottbus Film Festival, Marjorie Bendeck, director of Connecting Cottbus, Jeremy Zelnik, head of industry at Les Arcs Film Festival, Marge Liiske, managing director of Baltic Event, Nikolaj Nikitin, the Berlinale’s delegate for Central and Eastern Europe, and Guillaume Calop, general manager of Les Arcs Film Festival. Smugulski commented: “The Polish party is always very popular among the European Film Market guests. It was a great opening of many of our activities during the festival.” The PFI’s Berlin events include a conference promoting Poland’s new production incentive program on Sunday at Berlin’s House of Representatives building.